Last Night's Winner: Akron, But Not Cleveland. No, Never Cleveland. In sports, everyone is a winner-some people just win better than others. Like the fine people of Akron, Ohio, who received thanks from LeBron James in a full-page newspaper ad that didn't happen to mention Cleveland or the Cavaliers. Zydrunas Ilgauskas took out an ad in the Cleveland Plain Dealer yesterday, and while we took him to task for some lines he probably shouldn't have written, the heat's going to be on LeBron for the lines he didn't. "Thanks to the people in Cleveland." Any of those would have been totally cool. But not a single word about Cleveland, or the Cavs, where he spent seven years of his life receiving nothing but worship. For all my life, I have lived in Akron — and for that, I am truly a lucky man. You know who's not particularly broken up about you moving away? Most of the residents of Akron. And the ones that are upset are Cavs fans. Would it have killed him to write the word "Cleveland?" Or include a photo of him in a Cavs jersey? We get it. He feels like management treated him unfairly, and the fan base hasn't been understanding of his decision. So, as a heartfelt gesture, he wasn't about to ignore that and thank them. 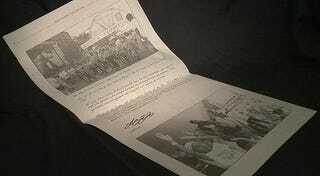 But no one believes that this ad is a heartfelt gesture, or that James even wrote it himself. It's just business to not burn any bridges, and maybe preserve a few fans back home to buy your sneakers. As Matt Moore of CBS Sports nailed it this morning, taking out this ad — and intentionally snubbing Cleveland — is just bad business. And it's not out of line with anything else that's gone down in the summer of LeBron.